As my boat coasts towards the humble harbour of Portia I’m treated to a lovely view of the town and its surroundings. A cute farm sits in the middle of several green fields while a lush forest spreads out to the west. I can see a waterfall that cascades into a river, which flows through the hills and down into the ocean. The town of Portia is a little further inland, and I can just about see the red tiled roofs peeking over the town’s wall. The sea is calm and I follow its lead. But when I study the horizon again, I do a double take. As I drift closer and the clouds start to fade, I can see colossal metal monuments in the distance. They look old and abandoned, covered in green foliage and clear signs of wear. They tower over Portia, taller than the port’s lighthouse, higher than the highest mountain. There’s one that looks like a metallic arm poised right above the town – I’d be extremely worried about it falling if it wasn’t for the brown rust that has it stuck in place. For the first time, I understand why Pathea Games has described Portia as post-apocalyptic. I imagined my stay in the seaside town to be entirely relaxing, drifting between crafting and farming, but there seems to be a bit more to this sleepy town than that. There’s a history here waiting for me to delve into. 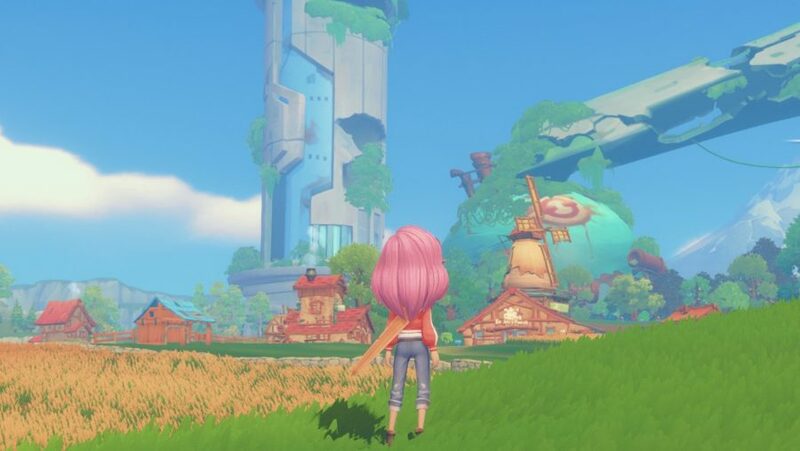 My Time at Portia evokes the escapist country life of games like Stardew Valley and Harvest Moon: you can grow crops, care for animals, go mining, partake in some fishing, and befriend the local residents. But where farming has been the main money maker in its forebears, crafting and building are at the heart of My Time at Portia. They are the means by which you progress through the game and prove yourself to be a staple citizen in Portia’s community. As I set my feet down on the shore, the mayor hands me a letter from my father, explaining that he has run off to the other side of the world and left me his empty shell of a workshop – thanks Pa. For the first in-game week in Portia, you focus purely on resource gathering and crafting to help get your workshop up and running. There’s a lot to do, but Portia gives you small missions to complete that slowly open up the world without overwhelming you. The workshop handbook also guides you through the crafting process – think of it as a wiki you don’t need to minimise for – so there’s an easy build-up from crafting a simple wooden box to building bridges. Residents commission work, gently pushing you to quickly get to grips with the system. This streamlining gives Portia a more leisurely incline than its peers, but can also work against the game. After an in-game month of crafting and building, I felt that I had learned all the basics and was ready to make decisions on my own – but the game was still guiding me through missions that couldn’t be avoided, leaving me little room to do my own thing. 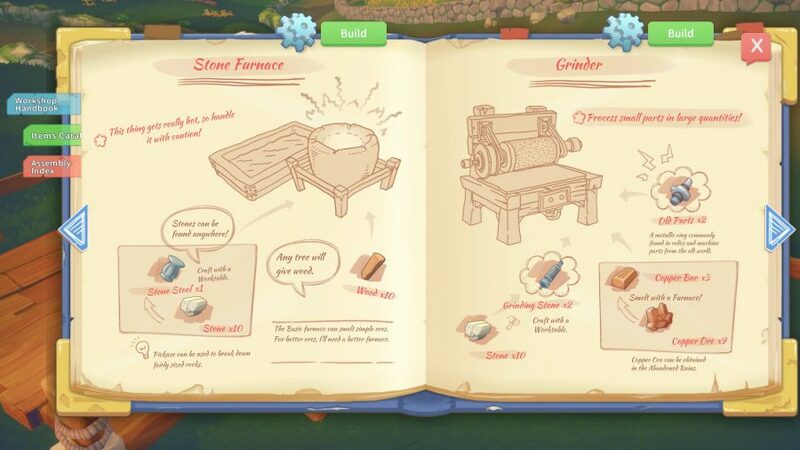 I wanted to plant more vegetables and really, well, dig into the farming element of Portia. But the land you’re given when you start is modest, and your crafting tools start to fill up the space quickly. You can buy more land, but it’s pretty expensive, and given the relaxing – but slow – nature of gathering resources, crafting, and then selling, saving up becomes a grind. Couple that with Portia’s quick day/night cycle, and you’ll find that getting more than two or three things done in a day is impossible. 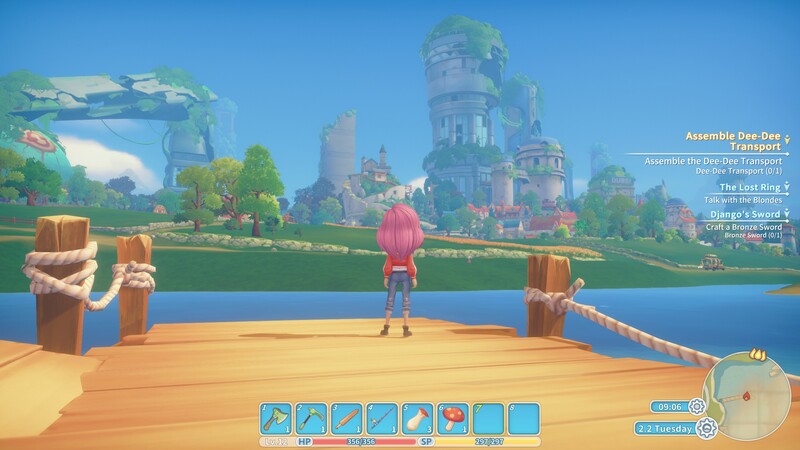 When you need a little break from the workshop, however, the bright and bucolic world of Portia is lovely to explore. As you step outside you’re greeted by a golden field of wheat – home to several scarecrows – and a windmill, its sails passively rotating in the breeze. As you make your way into town there are lots of small storefronts, and residents bustle around – some of the 30 characters you can befriend and romance. There’s a surprisingly dramatic story behind this idyll, however. The whole town and its residents seem to be recovering from an apocalyptic event that destroyed parts of humanity. The giant metallic structures and abandoned ruins are a constant looming reminder. My Time at Portia, Harvest Moon, and Stardew Valley make farming look relaxing with a bountiful crop only a few clicks away. But how realistic are these games? We asked a farmer to find out. This calamity threw humanity into two mindsets that the residents of Portia encompass. There’s the Church of the Light, a key religion in the town that believe the cause of the disaster was human technology. Members of the Church of Light live in fear of old gadgets, and warn that use of it will have history repeat itself. On the other side are the residents of the Research Center, who want to investigate old tech for the benefit of mankind – or what’s left of it. They take any relics you find in the ruins and analyse it, helping you craft better creations that can help out the town. Unfortunately, the residents don’t share my interest in their lore. Though their character designs are colourful, they come across a little flat. When speaking to them around town, their dialogue is lackluster, and doesn’t really reveal anything about their personalities or lives. No one seems to know – or care – at all about the giant robot goliaths stooped over the town. Maybe it’s been a long time for the characters in Portia, but I’m desperate to learn more about the mysterious event that gets alluded to but never explained. Well, screw them. 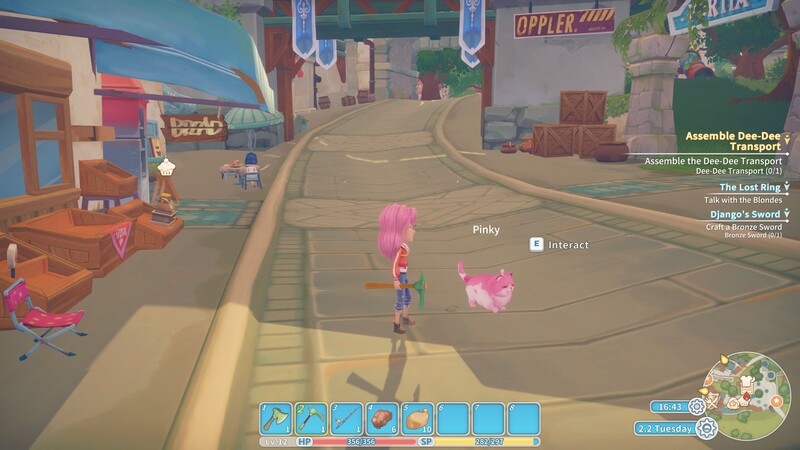 I spotted a bright pink cat, appropriately named Pinky, that matched my character’s hair colour and decided that my number one priority would be winning her fluffy heart. She isn’t much of a conversationalist, but I know I’m not missing much elsewhere. When I first saw Portia from its beach, my curiosity was instantly piqued . A beautiful town with a dark history, tied to relaxing crafting and farming mechanics, make the foundations of a great game. Sadly, Portia is held back by the grindy and streamlined nature of its crafting system, and even after two in-game months of getting to know the place, nothing has really changed in this quiet, sleepy town. A gorgeous game with solid crafting mechanics and a mysterious post-apocalyptic tale, but its intriguing story is buried beneath slow pacing and flimsy characters.